10And he said, What hast thou done? the voice of thy brother's blood crieth unto me from the ground. Seth apparently is the direct result of the death of Abel. It's funny that in the beginning of creation Adam and Eve gave one of their children an Egyptian name. Wicked in this sense comes from the greek word ponéros which can mean evil, wicked, bad, malicious and slothful. XIII. And Abraham said, My lord chief-captain, who is this most wondrous judge? and who are the angels that write down? and who is the angel like the sun, holding the balance? and who is the fiery angel holding the fire? The chief-captain said, "Seest thou, most holy Abraham, the terrible man sitting upon the throne? This is the son of the first created Adam, who is called Abel, whom the wicked Cain killed, and he sits thus to judge all creation, and examines righteous men and sinners. For God has said, I shall not judge you, but every man born of man shall be judged. Therefore he has given to him judgment, to judge the world until his great and glorious coming, and then, O righteous Abraham, is the perfect judgment and recompense, eternal and unchangeable, which no one can alter. For every man has come from the first-created, and therefore they are first judged here by his son, and at the second coming they shall be judged by the twelve tribes of Israel, that I too may see how they are judged. A pseudepigraphic text is non-canonical Jewish religious literature written in the timeframe of 200 BC to 200 AD. The author of the work would attach a revered or apostolic name to it to give it "street cred." The works themselves are based on Jewish legends and tales common to the era they were written. Then Adam rejoiced at Eve's deliverance, and also over the children she had borne him. And Adam ministered to Eve in the cave, until the end of eight days; when they named the son Cain, and the daughter Luluwa. When the children were weaned, Eve again conceived, and when her pregnancy came to term, she gave birth to another son and daughter. They named the son Abel and the daughter Aklia. 10 But as to the hard-hearted Cain, Satan came to him by night, showed himself and said to him, "Since Adam and Eve love your brother Abel so much more than they love you, they wish to join him in marriage to your beautiful sister because they love him. However, they wish to join you in marriage to his ugly sister, because they hate you. 11 Now before they do that, I am telling you that you should kill your brother. That way your sister will be left for you, and his sister will be cast away." Apparently Cain had designs on the beautiful sister who had already been promised to Abel. Okay so there's some background on those two and now on to the reason behind writing this blog entry. I'm going to give you some background on a couple characters from ancient Egyptian myths - Set and Osiris. Set and Osiris were part of the great ennead of Heliopolis in ancient Egypt. Atum was the head and from him emerged his two children Shu and Tefnut. From these two were born Geb and Nut. Geb is the earth and Nut is the sky. Shu eternally separates these two allowing creation to take place in the natural world. Nut gives birth to Osiris, Isis, Set and Nephthys. I'll concentrate on these latter four of the ennead for now. 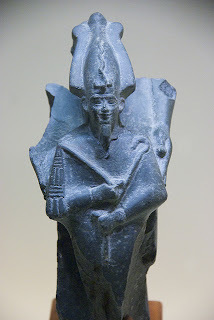 Osiris I have mentioned many times previous in this blog space so I'll just recap. Osiris is murdered by his brother Set, dismembered and then reconstituted by his sister-wife Isis. Osiris later becomes judge of the dead souls in the great hall of the two truths. Set is the outcast brother, lord of chaos and confusion and great of strength. Set is depicted as a fantastical animal creature. His wife is Nephthys, Nebet-Het in the ancient Egyptian script. She is the twin sister of Isis and her name means 'Mistress of the House'. Seth, God of Confusion, by H. Te Velde, page 55.
who is this most wondrous judge? and who are the angels that write down? and who is the angel like the sun, holding the balance? and who is the fiery angel holding the fire? The chief-captain said, "Seest thou, most holy Abraham, the terrible man sitting upon the throne? This is the son of the first created Adam, who is called Abel, whom the wicked Cain killed, and he sits thus to judge all creation, and examines righteous men and sinners. And Michael said to Abraham, Seest thou the judge? This is Abel, who first testified, and God brought him hither to judge, and he that bears witness here is the teacher of heaven and earth, and the scribe of righteousness, Enoch, for the Lord sent them hither to write down the sins and righteousnesses of each one. The angel like the sun, holding the balance in his hand, is the archangel, Dokiel the just weigher, and he weighs the righteousnesses and sins with the righteousness of God. The fiery and pitiless angel, holding the fire in his hand, is the archangel Puruel, who has power over fire, and tries the works of men through fire, and if the fire consume the work of any man, the angel of judgment immediately seizes him, and carries him away to the place of sinners, a most bitter place of punishment. In the above picture we see the heart being weighed in the balance by Anubis the jackal. We see Thoth as an ibis bird, the divine scribe, recording the goodness and betrayals of the heart. We see Ammit the lion, hippopotamus, crocodile composite ready to seize and devour the heart of the failed aspirant. Further along in the scene we see the successful aspirant being led to the divine judge Osiris who is sitting on his throne surrounded by his twin sisters Isis and Nephthys. It's tempting to stop here because the parallels are uncanny but I'd like to investigate further by examining the names and occupations given to these Old Testament characters. I am Thoth, Lord of Justice, who vindicates him whose voice is hushed; protector of the poor man who has suffered loss of his property; who dispels darkness and clears away the storm. I have (given) breath to Wennefer, even the fair breeze of the north wind, as when he came forth from his mother's womb. I have caused him to enter into the secret cavern in order to revive the heart of the Inert One, Wennefer the son of Nut, the vindicated Horus. 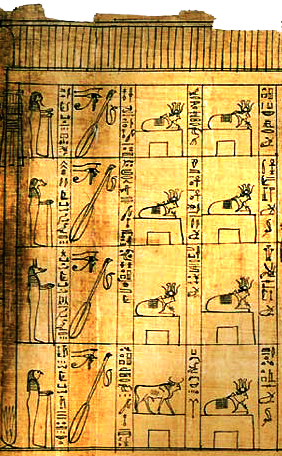 Wennefer in this passage being an epithet of the heart god Osiris. Furthermore Abel's occupation is given to us as a shepherd and from this we have the unmistakable connection to the ram. Osiris is the Ba that comes to incarnate into matter; the Ba being the onomatopoeia sound that comes from a ram's bleat. As well throughout the monuments in Egypt Osiris is found wearing the Atef or Hemhemet crown which is the ram's horn crown. Horus does not kill or destroy him but lives amicably with this Set, Set's strength being now used in a subservient way as a force for goodness, and Horus is crowned king of Upper and Lower Egypt or more to the point king of the spiritual and the material. Remember in Genesis 4:15 the Lord had placed a mark on Cain to ensure he would not be slain. The name Cain is a name for the Ka spirit, the 'Ca' of for Ka and the 'in' for 'an' which is an ancient word for spirit. The Aryan root "an" also signifies "wind" and "spirit", and survives in words like "animal", "animate". At this point there are a few ways to interpret the significant similarities in this story. One can choose to ignore them and go on believing it's just a coincidence. You could concede the resemblance is due in part to the story being one of antiquity and the Hebrew story happened to borrow elements from this well known myth as it would not be out of the question since the Hebrews did sojourn in Egypt for a period of 400 years or four generations (the bible gives conflicting data on this point). Or you could be thinking that many of the stories in the Old Testament, especially in the first five books, are rehashed versions of the great myths of the greatest civilization of antiquity; a civilization who left its myths carved in stone for all the world to see. One other thing I'd like to point out are the hidden, faint echoes and inversions of stories throughout the Old Testament that point back to the myths of ancient Egypt. The names of Cain and Abel hint at this connection but also the choice of the Egyptian name Seth for the child born due to the death of Abel. In the ancient Egyptian fable Osiris must die in order for Horus to be born. Seth (or Set) is Horus' nemesis however in the bible Seth is the result of Abel's death at the hands of Cain. I'm pretty sure the wisdom being referred to here is not a manual on how to build a pyramid. In any event my next blog post will show the parallels between an iconic ancient Egyptian symbol and Cain. I just happen to stumble upon your blogspot while doing a search on info regarding Sirius and Egyptian history. Without having foreknowledge of the Ka and the Ba entities until I read your article here I now see a correlation of these entities with some sketches I did back in 2003 regarding the horrors of sexual abuse/molestation, how sperm when spilled outside of the directive of true love and/or procreation is a form of sin. That sketch I drew is entitled, "Killing the Spirit". It is absolutely fascinating to see how Ka and Ba entities play a direct relationship into the theme of my drawings! I look forward to reading more of what you have written in your blog. Very enlightening. Thanks for sharing. Glad I could share part of the dialogue that goes on and on in my head!